The Barclays Center, home of the NBA’s Brooklyn Nets, will play host to the next installment of the Premier Boxing Champions on NBC on April 11. 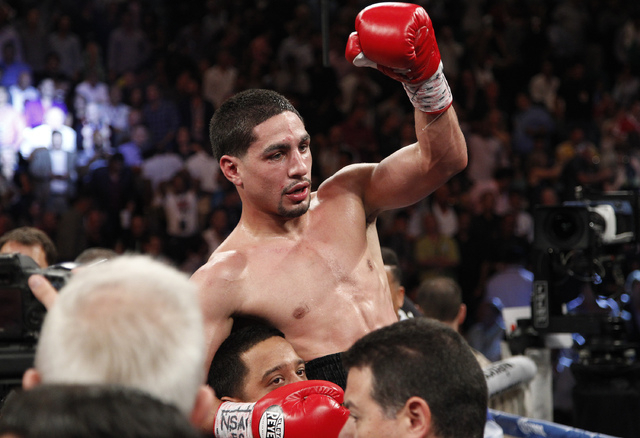 World champions Danny Garcia and Andy Lee will headline the card in separate fights. He hasn’t been able to get Floyd Mayweather Jr. to fight in his building, but Barclays Center CEO Brett Yormark is happy doing business with Mayweather’s manager, Al Haymon. Barclays, home of the NBA’s Brooklyn Nets, will play host to the next installment of Haymon’s Premier Boxing Champions on NBC on April 11. Junior welterweight champion Danny Garcia will defend his World Boxing Association title against Lamont Peterson, and Andy Lee will risk his World Boxing Organization middleweight belt against Peter “Kid Chocolate” Quillan. Yormark spent time with Mayweather at last month’s NBA All-Star Weekend, which was held at the Barclays Center and Madison Square Garden. He’s still hoping Mayweather will fight in Brooklyn before he retires. Yormark, who had an exclusive deal with Golden Boy Promotions to host fights at the Barclays Center the first two years it was open, said he’ll do business with anyone. 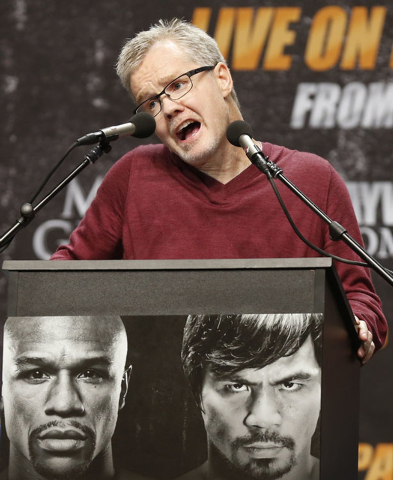 ■ FREDDIE FINED — Hall of Fame trainer Freddie Roach isn’t afraid to speak his mind. In doing so, he has been known to utter a profane word or two. But Roach’s top fighter, Manny Pacquiao, would prefer that his trainer watch his mouth. So the two made a deal in which Roach is fined $5 every time he curses. During Wednesday’s news conference in Los Angeles to promote the May 2 megafight between Pacquiao and Mayweather at the MGM Grand Garden, Roach dropped a few F-bombs, and by the time he was through, he had rung up $30 in fines. “If this keeps up, I’ll lose my entire purse,” Roach said, laughing. A couple of reporters offered to pay Roach’s fines, but he politely refused. ■ PORTER WINS — Welterweight Shawn Porter knocked out Erick Bone during the fifth round Friday on the Premier Boxing Champions card at Ontario, Calif., before a national audience on Spike Television. Bone was a last-minute replacement for Roberto Garcia, who was well over the 147-pound limit and didn’t even attend Thursday’s weigh-in. Porter (25-1-1) knocked down Bone (16-2) twice during the fifth round, the second time for good with a right-left combination to the head. Bone was counted out at 2:30. In the main event, Andre Berto (30-3) stopped Josesito Lopez (33-7) during the sixth round of their welterweight bout. Lopez was knocked down twice during the round when referee Raul Caiz Jr. stopped the fight at the 1:08 mark. ■ AMATEUR CARD — The North Las Vegas Center Ring boxing club will host an amateur card beginning at 6 p.m. March 28 at the Silver Nugget. Twenty bouts are scheduled.